Delicious soup recipes for all you soup lovers out there! Last week we moved to a new house, the fourth time since 2008. I love the exciting live we life, love the house but with a family of five, it’s quite a schlep! To make sure we get the right nutrition in hectic times, this vegetarian soup is perfect. It truly is a superfoods soup containing lots of protein, minerals and vitamins. It’s not only healthy but simple delicious too. So if you are busy but still want something good: this is the answer. Enjoy. Set a large pot over medium-low heat. Add the sesame oil and heat for 1 minute. Sauté the shallots and when they are about done add the minced garlic. Once translucent add the sliced carrot and one teaspoon of ground ginger. Toss the ingredients until the carrots are covered with shallot, garlic and ginger and cook for a few minutes. Add dashi stock to pot and bring to boil. Once boiling reduce the heat, and add the edamame, shiitake mushrooms and tofu. Simmer for 5-7 minutes. Meanwhile, bring a separate pot of water to a boil. Add the soba noodles and cook until tender. Drain with a colander and run under cold water, set the noodles aside. Scoop out one ladle of soup and dissolve 2 tablespoons of miso in it by whisking it to a smooth consistency. If you try to dissolve the miso in the soup directly, it might clump together. Once the miso is dissolved return it to the broth and simmer for a few minutes. Be careful not to boil the soup after adding the miso. Season the soup with some soya. 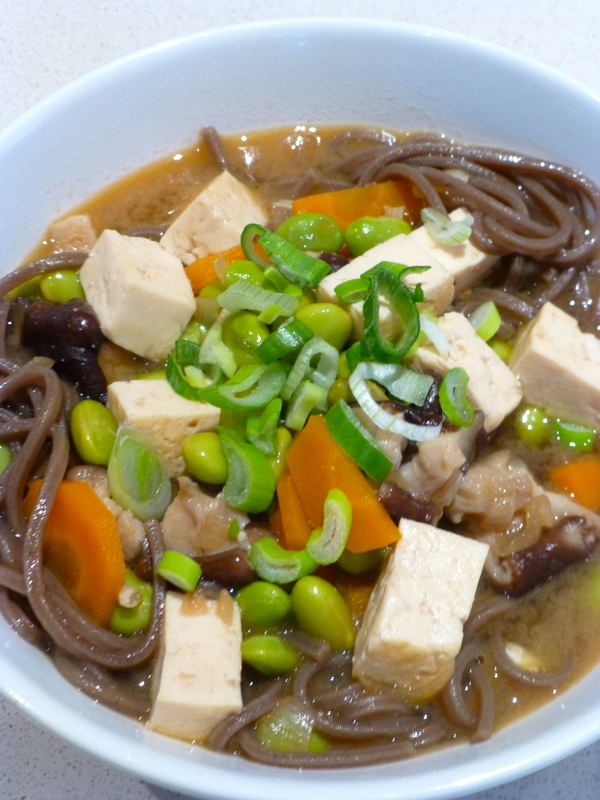 Divide the soba noodles among the bowls, ladle soup on top and garnish with green onions. Serve immediately. Click to follow I Love Soup and receive an email when new soup recipes are posted.